The project started with the name of Infectious, as gameplay resembled a petri dish with two kinds of viruses. Each had to infect as many cells as possible. They could either infect a cell nearby or jump over a nearby cell to retreat from an attack. When a nearby cell was infected, nearby cells of the same kind were also infected. This way two players could compete with each other to infect as many cells as possible. The idea of Jar.War is the same, just with bits & bytes, instead of cells. Thus, it was a virtual infection. The game was developed to a playable demo state. A work in progress demo was released. 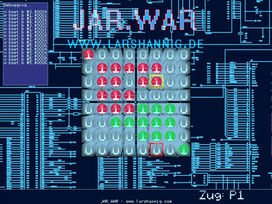 The game Infectious was renamed Jar.War for a study project. It was written in C and rewritten in a few hours to run from Java, because Java was the language of choice in the game design study, not C. At the same time I think it's noteworthy to say, this was one of three projects which ended up being a playable game with graphic output, earning the highest mark.